One of the most concerning issues today is that the ozone layer , which protects humans from most of the sun's damaging ultraviolet (UV) radiation, is being depleted by pollution. Chlorofluorocarbon (CFC) emissions are claimed to be the main cause of this phenomenon. Vietnam made considerable efforts to phase out the use of CFCs by substituting hydrofluorocarbon (HFC). However, in 2016, the Parties to the Montreal Protocol adopted the Kigali Amendment to phase down HFCs since the chemicals are potent and fast-growing greenhouse gases. Under the Kigali Amendment, developing countries will follow with a freeze of HFCs consumption levels in 2024, with some countries freezing consumption in 2028. By the late 2040s, all countries are expected to consume no more than 15-20% of their respective baselines. Overall, the agreement is expected to reduce HFC use by 85% by 2045. Once the document takes effect in Vietnam, the Government will commit to comply with the phase out schedule for the HFC phase-down. Industries, sectors and businesses will take the chance to renovate their technology, improve their economic efficiency, practice sustainable production, and raise their competitiveness, thus opening up new opportunities in business, while contributing to creating more jobs and facilitating socio-economic development. Vietnam is a country that does not produce ozone depleting substances. The substances were previously imported for fire extinguishers, refrigeration and air-conditioning applications. Currently, the MONRE has actively coordinated with functional agencies in preventing the illegal trade of ozone depleting substances into Vietnam. In the same effort to protect the environment, energy labelling is seen as an effective solution to drive consumers’ use of high-performance equipment, gradually eliminate inefficient and obsolete products, and reduce substances which are the main cause of ozone depletion and the greenhouse effect. 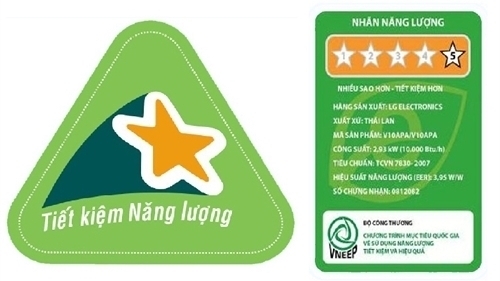 The Energy Labelling Program has been implemented in Vietnam since 2008 and energy labels have been made compulsory since July 1, 2013. The program sets a goal to achieve a minimum cumulative saving of around VND10 trillion (US$ 480 million) and a reduction of 34 million tonnes of CO2 emissions by 2030. Electricity saving will be about 6,000 GWh per year, which reduces the demand for electricity generated from two coal-fired power plants with a capacity of 500 MW (equivalent to US$ 1 billion invested in coal based power plant). According to statistics released by the Ministry of Industry and Trade (MOIT), since the Energy Labelling Program became compulsory on July 1, 2013, around 15,000 products and equipment in 19 categories were sealed with energy labels as of June 2018. Since 2017, almost all air conditioners in Vietnam have been sealed with energy labels. According to the report of the Vietnam Society of Refrigeration and Air-Conditioning Engineers, it is estimated that 100 million kWh of electricity has been saved annually as consumers have shifted to air conditioning products with higher efficiency. In the past, consumers used to buy products based on their perceptions of prices and models but now they also take into account the products’ technical information and energy consumption. It is forecast that energy-labelled products will help to reduce electricity consumption by 10% and 30% by 2020 and 2030, respectively. Energy labelling is not only a way to go green but also helps consumers to choose the most energy-efficient products. In other words, it is a financial saving solution for each family.